Much like the first computer that took up roughly 1800 square feet and was used only for commercial uses, the 3D printing technology has come a long way as well. No longer are the 3D printers being used only to produce custom parts in metal fabrication factories, in fact they’re almost as common in a household as a desktop printer. More and more people are including the 3D printing technologies in their home, using them for anything from crafty hobbying to creating a replacement part for the back of their remote controller. One of the most popular 3D printers for the home novice operator is the MakerGear M2. This particular 3D printer is one of the highest rated and most universally owned devices in the industry. Customers both experienced in creating their own three dimensional parts and those just looking to get into the art have found mostly success with the M2. Before spending upwards of $2,000 and countless hours in setting up the machine, find out if this model is in line with what you’re looking for. Final Review: Is it Worth it? MakerGear is a small, USA based business that has been involved in the 3D printing industry since 2009. The company has made 3D printers for not only home private use but also distribution for teachers, engineers, artists, and entrepreneurs. The M2 is their signature product on it’s third generation of release, giving ample time to fix bugs and implement customer improvements. They sell the M2 directly from their website, available in either a kit form that is assembled by the consumer or a fully built unit with increased costs but with added convenience. The M2 usually ships in about 3-4 weeks depending on product availability but is also available through online outlets such as Amazon. The first thing that sticks out about the M2 is its striking appearance. With a black powder coated frame and durable steel welding the printer won’t be an eyesore sitting in the home. Most of the frame is in fact steel with the exception being some plastic parts around the extruder. The great thing about those parts is that they can be 3D printed and replaced if they were to break or malfunction. Other than that an open frame design allows for unobstructed viewing of objects being printed and allows the parts to cool naturally. First things first, the M2 isn’t going to build large scale parts or big intricate assemblies as its build volume is only 8” X 8” X 10”. Even so, this is actually a positive attribute for home hobbyists because the printer fits comfortably on a large desk without becoming too much of an obtrusion. For the design and building of small plastic parts, their aren’t may printers on the market more suitable than the M2. The MakerGear M2 prints plastic parts using PLA or ABS. Although they aren’t supported by the manufacturer many customers have had success printing using nylon and a flexible PLA which really opens up the design options. Both PLA and ABS are thermoplastics which means they are soft when heated but harden when cooled. The materials need to be stored safely when not in use to avoid absorbing moisture but the MakerGear M2 creates very accurate parts when using the proper material. PLA – Harder than ABS plastic and prints with much less warping. Works great with the MakerGear M2 because of the heated bed. ABS – Is more flexible than PLA but can be harder to print and maintain shape. Flexible PLA – PLA properties but looks and feels more like rubber. Nylon – Very strong and has a high-resistance to fatigue. With the MakerGear M2 a user will have the most success printing with PLA and ABS but it’s nice to know that other filament options are feasible. The M2 prints with G-code files like most 3D printers. Therefore a 3D model must be made in an AutoCAD-like software and sliced into layers with a separate program. Luckily depending on where you purchase from the slicing software Simplify 3D (trial version) is included with the installation package. The designs (.STL files) can be sent either through an Ethernet connection to a computer or via a USB stick. There are even on-printer controllers that are optional in a custom M2 build. There are settings and alignments that must be perfected with every 3D printer, and the MakerGear M2 is no different, but for the most part the machine is relatively maintenance free after set up. The durable steel frame keeps the extruder head aligned for the most part and the heated surface pad helps designs print with minimal adjustments to temperatures, speeds, etc. For the most part, 3D printers marketed for home use have pretty much the same fundamental groundwork. The build volume will vary slightly as will the fact if a device has one or two extruders (MakerGear M2 has one). Other add-ons include an LCD screen (not standard on M2) or an enclosed printing area. Besides the LCD screen and the second extruder head the M2 is very much on par with the industry standards. The filament printing size is the common 1.75 mm, files can be transferred either by USB or with the SD card, all three operating systems are supported (Windows, Mac, Linux), model conversion software is needed as it is on nearly all 3D printers, and the dimensions are very similar to leading industry models. 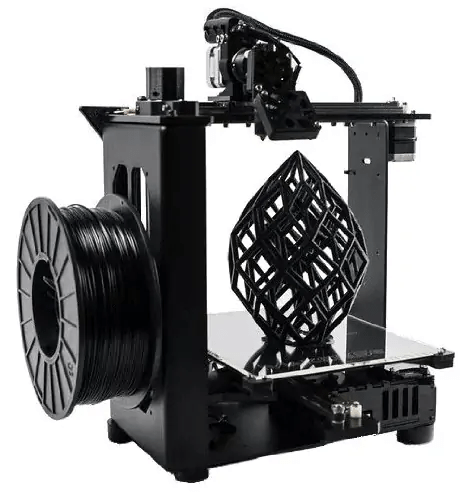 As far as price, the MakerGear M2 at around $1800 offers more value than the MakerBot Mini 3D printer and is much more stylish than the Airwolf V5 ($1,695). UPDATE: Since originally publishing this review, I’ve also published a direct comparison between the M2 and the popular Replicator 2 from Makerbot. When shopping for 3D printers some considerations need to be taken into account based on price. Obviously a $2,000 – $3,000 printer is going to contain all the bells and whistles – LCD screen, dual extruder, larger print volume, accepting of more filament types, more detail on the prints, etc – so you need to compare apples to apples. So far the majority of online reviewers have bit into those apples with nary a sign of any worms. Comparitively the MakerGear M2 meets or exceeds many of the features and specs in its product range. It’s important to remember that all 3D printers will have some limitations. For instance only units with multiple heads will be able to truly print in multi-color or multi-filament. Plus there are some nuances with running any of the devices from the smell of plastic as it is heated to the noise associated with the print. The MakerGear M2 is no different and the conveniences of the small design for sitting on a desktop could be negatively affected by the associated smell and noise. The areas where the M2 doesn’t stack up to its competitors are few, but they do exist. Build Area: For instance the 8” X 10” X 8” build area is quite small for a device with so much detailed design potential. Single Extruder Head: Another limitation to experienced designers is the lack of support for adding a second extruder head, something that is trending towards an industry norm (MakerGear plans to release a beta dual-head printer in the future). Takes Some Learning: Other than that pretty much the only area that the MakerGear fails to rank in the 90th percentile is the ease of use. This is not a true ‘plug and play’ device as there are a number of controls and settings that must be adjusted and calibrated before successful printing. Enclosed Printer Area? Another option that MakerGear would be wise in pursuing would be an enclosed printing area. The open area is nice for viewing a print but it also lends itself to design failure when printing in a cold or humid room. The MakerGear M2 is a true optimum consumer-level 3D printer. Once the learning curve is defeated users can trustfully start a print in the morning and leave it unattended until finished. The sturdy and stylish design and abundance of features are befitting of a printer $3,000 or more at roughly half the price. If you are interesting in learning more about buying the M2, I’d recommend checking this listing to start.